Cartamundi is worldwide leader in production and sales of playing cards, promotional cards, official casino cards, collector card games (like World of Warcraft) and board games. 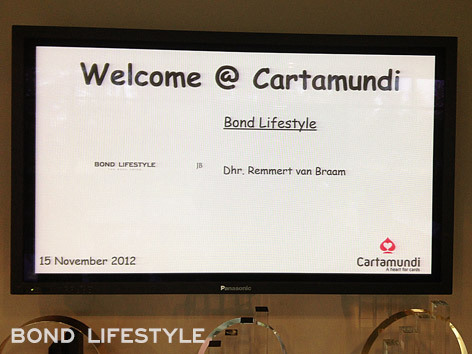 On November 15th, I park my car in front of an impressive entrance of the Cartamundi offices and factory in Turnhout. When I enter the building, I am welcomed by the large LCD screen in the main hall, showing my name and Bond Lifestyle logo to every visitor that morning. A very nice welcome indeed! 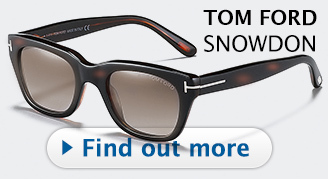 I'm meeting Tom Sprengers, Account Manager Premium The Netherlands. 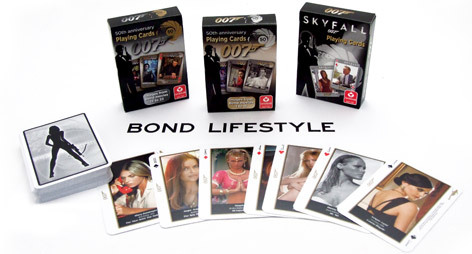 He tells me Cartamundi has been involved with the Bond franchise since 2002, designing not only Bond themed collectable card decks, but also designing and producing the official playing cards and chips so prominently used in the movie Casino Royale (2006). The Casino Royale cards and chips are still available and one of the most popular card sets made by the Belgian company. 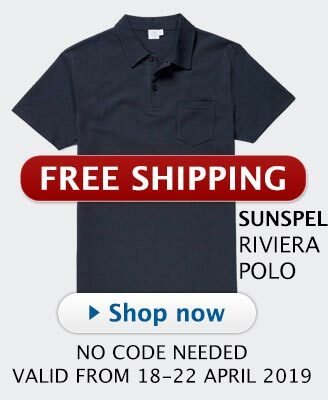 Security in the building is very tight since producing official casino playing cards and highly collectible World of Warcraft cards is big business and worthy of a MI6 style secrecy. 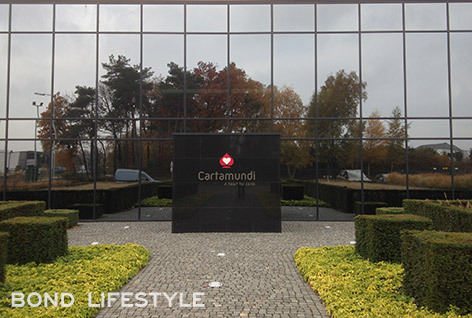 I get a tour of the Cartamundi headquarters, starting with the sales rooms, followed by the atelier where all cards are designed, and onwards to the main production facilities. Each room is connected to the next, making this a highly efficient production process. The designers are sitting in the room next to the actual printing press machines, so the communication lines are very short. In the card factory, which consists of several large halls full of machines that print, cut, sort, seal and package each deck and set of cards ever made by the company. It's incredible to see the way everything is automated. Each card is photographed and checked for mistakes, all within a fraction of a second. Skilled employees are making sure the machines are fed the large sheets of cards or the unfolded carton boxes. 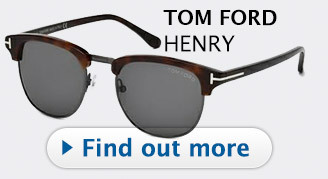 Special print machines are able to print many color layers onto special shiny paper, giving some cards a radiant effect. I realise that the Bond Lifestyle 5th Anniversary cards must have gone through some of these machines as well! I wish I could take a picture of all these ingenious machines, but unfortunately it is not allowed to take photos inside the factory. One area is reserved for the collector cards, which have to be divided into their packaging in a specific mathematical order to make sure the chances of getting that special golden or signed card are correct. At the end of the process, the cards, in their packaging, are waiting in large crates, ready to be loaded through the final large doors to be transported to their final destination. After the tour we meet up with Kris Galadé, Cartamundi productmanager, who shows me a table full of only James Bond 50th Anniversary and SkyFall products, which were released this year. 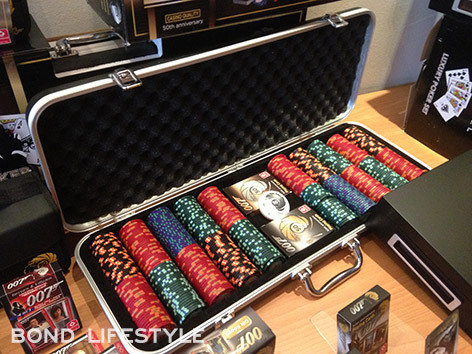 The sets include a Limited Edition 50th Anniversary case containing no less than 500 chips, two card decks and a dealer button. 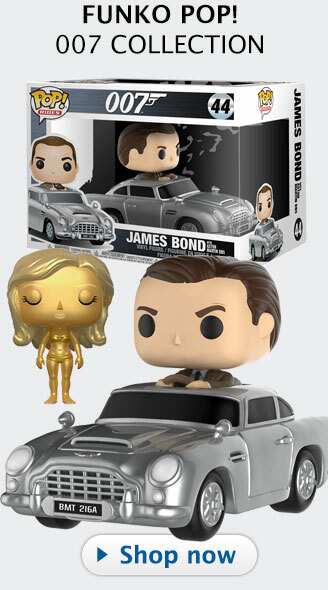 The set is limited to 3000 numbered pieces. 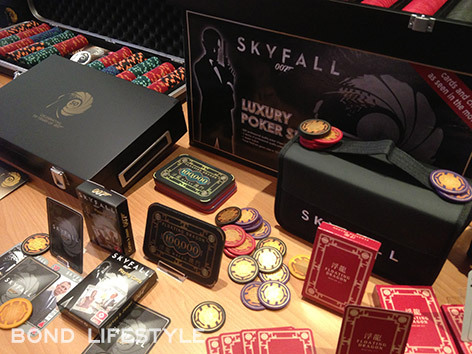 The SkyFall products include a luxury set and compact set, with the same cards and chips as seen in the SkyFall movie. To my suprise there are a few plaques of 10,000, 50,000 and 100,000 on the table, but although I'm allowed to observe them closely and photograph them, I'm not able to sneak them with me in my bag. Kris tells me that, just like the Casino Royale plaques, they won't be released for public sale. 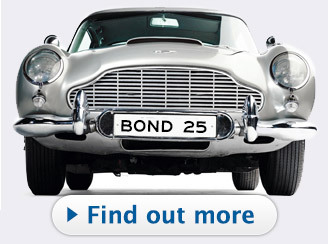 All plaques ever made for Casino Royale and SkyFall are now in the archives of EON and Cartamundi. Our only hope of ever acquiring these plaques is via an auction. 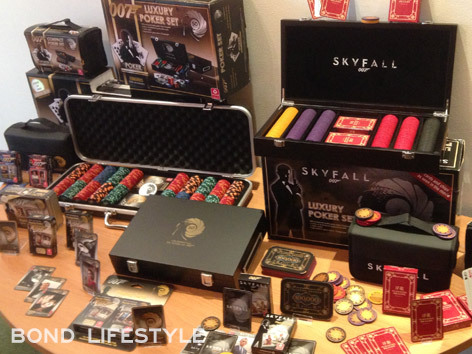 Talking about unreleased items: what about the Casino Royale One&Only Club chips and cards and the cards used by Le Chiffre on his yacht? 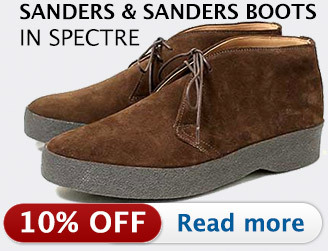 Both are designed and produced by Cartamundi as well, but also never made it to the store shelves. 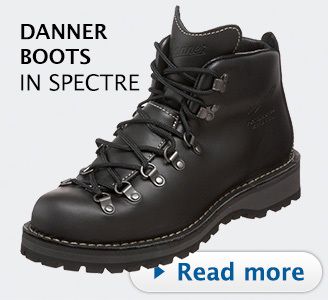 And there are no plans to release these either. 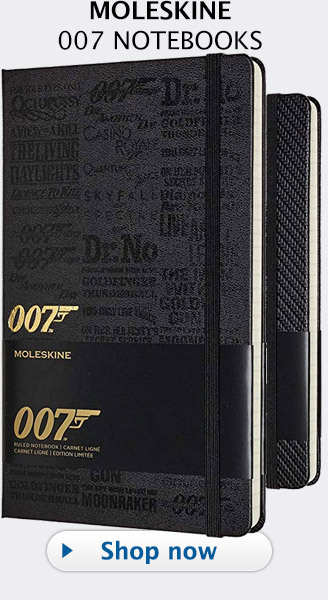 I suggest to Kris and Tom that a collector's set of Casino Royale cards, including One&Only and Le Chiffre (those just have a plain design on the cards) cards, would be very popular among us Bond fans. Another nice set is the Limited Edition set of 50th Anniversary cards with a golden edge. 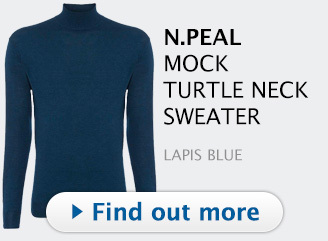 I must say this looks really nice in reality. The golden edge feels very thick although it is a very fine layer of gold. 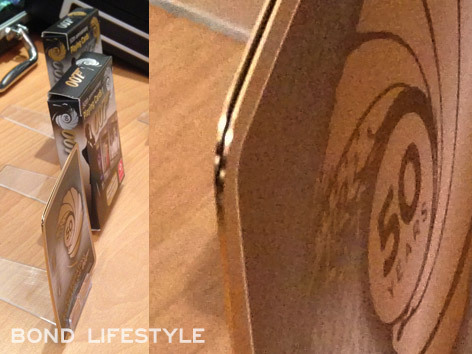 This set, consisting of two packs, comes in a metal tin and is limited to 5000 numbered pieces. After taking some more pictures of the great display and enjoying a tasty lunch, I say goodbye to the world of cards, knowing that Cartamundi really has a heart for cards.